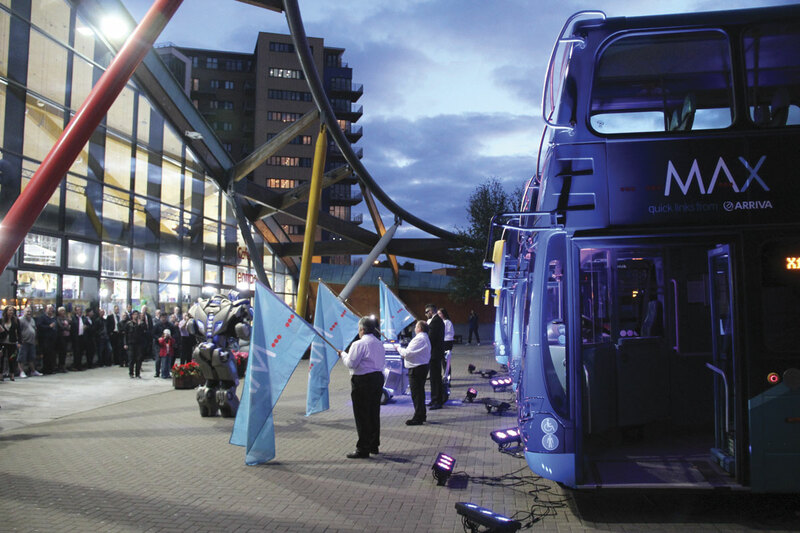 Arriva as a group has been very innovative in developing marketing initiatives and the latest of them, MAX, was unveiled in a typically flamboyant manner in Newcastle on Monday evening. 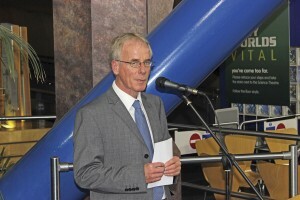 Held at the Life Science Centre in the heart of Newcastle in order to stress the idea of innovation, the launch featured an unusual special guest. 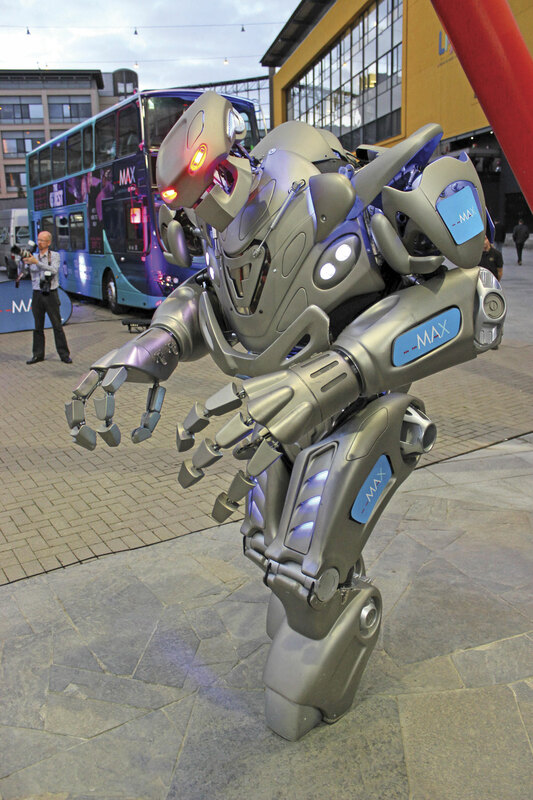 On a mission to ‘create MAXimum impact’ was Titan, a gleaming eight foot robot which, accompanied by ‘Dave’, whirred, flashed, sprayed and sang to the invited guests, including Nexus representatives, in an entertaining show interspersed with messages about the new MAX product. Nick Knox is Arriva’s Area MD for the North East. 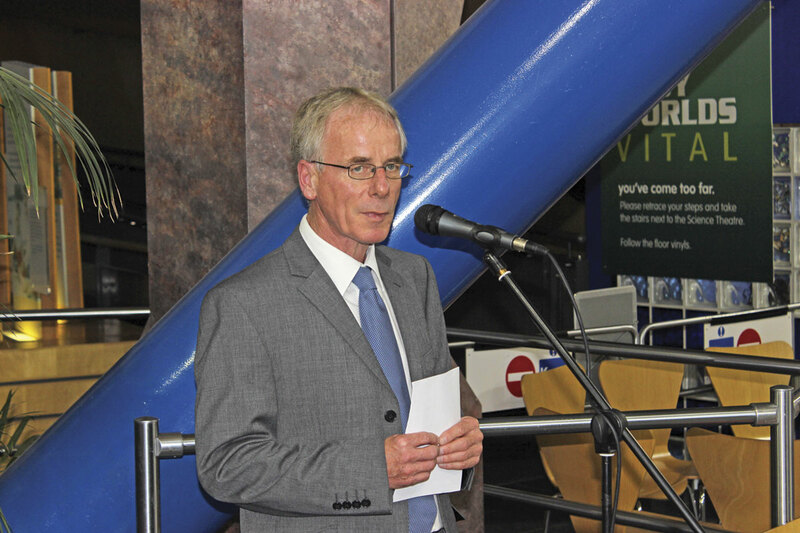 He explained that the launch marked the first of many MAX routes which would deliver maximum comfort for passengers, maximum connectivity with free wi-fi, excellence in customer service and maximum flexibility with a network of services covering an area from Berwick in the North to Scarborough in the South. He commented, ‘We have a strong network of inter urban services. This is about getting the comfort right and providing what people want from long distance services.’ Nick said that the MAX concept had been developed in the North East as they had thought about what could be done to develop the inter urban network. 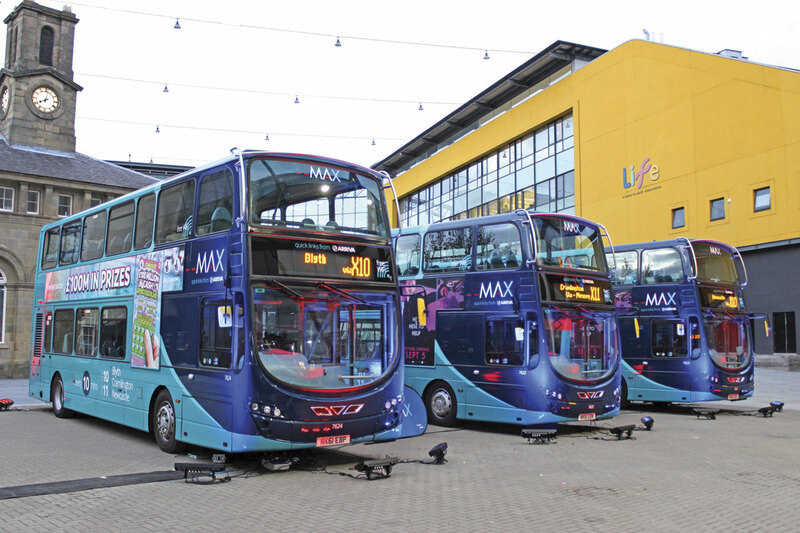 As the branding on the buses stressed, the MAX services will provide quick links between key centres throughout the day. Backing up the offer is a no quibble money back guarantee if a customer is not happy with the service. Promoted on the day was the first route to undergo the MAX treatment. This is the linked X10 and X11 service which provides a combined ten minute frequency between Blyth, Cramlington and Newcastle. The difference between the two parts is the route they take in and out of Blyth, the X10 serving Newsham Farm and the X11 taking Plessey Road but also serving Northburn, with the rest of the route common. Making use of the A1, both options cover the Cramlington to Newcastle journey in 25 minutes. Nick said that there would be seven MAX branded services operating across the North East by the year end, and by this time next year that figure will have grown to 14 separate services. The buses on the launch route are 13 three year old Wright Gemini bodied VDL DB300 double deckers which were already being used on the X10/X11 but have been upgraded for the launch by Bus & Coach World of Blackburn. The work included a complete repaint, new handrails, and upgrading of the Esteban Civic seats from V2 to V3 standard with new backs and new headrests. All of the seats are trimmed in two-tone blue E-leather with MAX branding stylishly incorporated in the headrests. Three of the fleet were present for the launch event. All of the X10/X11 buses are based at Blyth depot which has a total allocation approaching 53 buses. As part of the commitment to customer service included in the MAX concept around 100 drivers from Blyth are going through a customer service excellence training programme. Talking afterwards, Nick said that total expenditure on new vehicles and refurbishments this year would be £11.8m, explaining that while the X10/X11 buses were refurbished, new buses were being purchased for some of the MAX services. Across the MAX routes as a whole they were looking for growth of 5% a year on average, though the high frequency X10/X11 might well achieve in excess of that. He emphasised the ease of use of the route saying, that with a journey time of 25 minutes end to end, no car parking worries and the opportunity to use the wi-fi on board, ‘Why wouldn’t you use it?’ It was good value for money too with a commuter fare of only £16.50 a week. They would be looking at new ticketing initiatives once the network had been more extensively MAX branded. 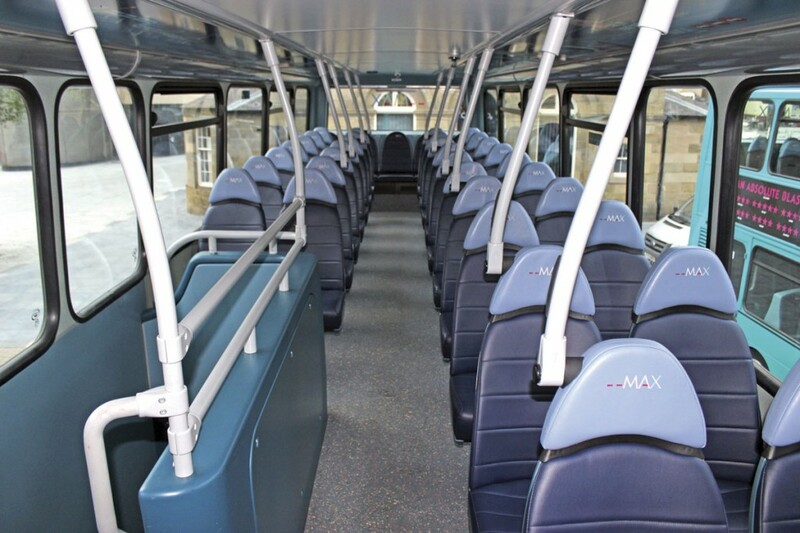 MAX is being introduced in addition to the Sapphire concept which Arriva North East first introduced late last year on the 7 service from Darlington to Durham. That has already seen 10% growth achieved and was followed recently by X21/X22 Ashington, Bedlington, Newcastle service. Soon to join them are the 5 from Brotton and Skelton to Middlesbrough and the X3/X4 from Whitby via Loftus and Redcar to Middlesbrough, so that there will be four Sapphire routes by the end of 2014. The 7 and X21/X22 offer a ten minute frequency while the 5 and X3/X4 jointly give a 15 minute frequency. 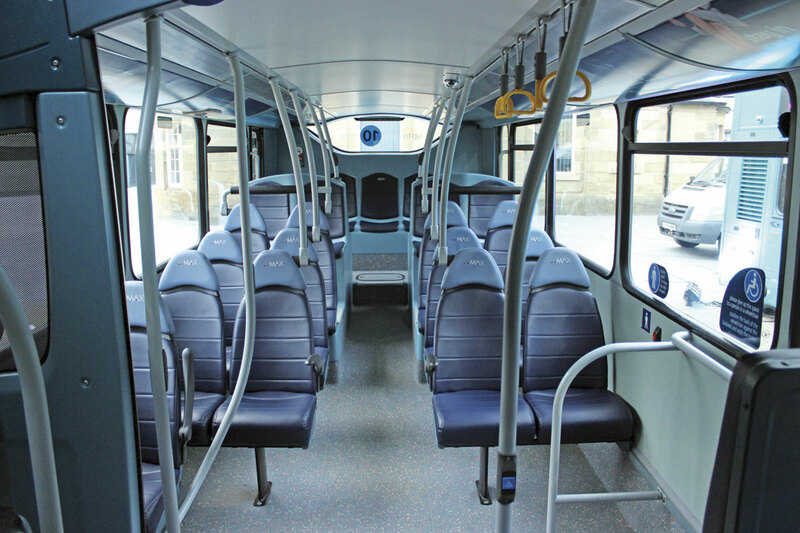 Sapphire offers a higher specification vehicle with features including the carry through of the branding to the flooring and elsewhere as well as plug points for charging electrical devices and next stop announcements. Although not part of the standard MAX package, Nick told me that Arriva is working with the local authority in Darlington to include next stop announcements on a MAX service to be introduced there. Nick Knox expects there to be 45 MAX buses in service by the of 2014 in the North East with a further 42 to be added in 2015. These are in addition to 54 Sapphire vehicles by the end of 2014 and an additional 14 in 2015. The average age of the fleet will reduce to 4.7 years. The MAX concept is also being introduced beyond the North East where it was developed. Arriva Yorkshire’s 268, linking Bradford and Dewsbury, which will be the first MAX service in Yorkshire and the pioneer ‘Great Yorkshire Connection’ was due to be launched in Bradford on 4th September. By the end of 2015 when the whole of the inter urban network has received the MAX treatment, Arriva North East will have a product that not only serves the local population on an individual route basis, but that can be marketed more effectively as a whole network to attract even more customers.